Continuing my quest to use up the retiring 2016-2018 In-Colours! This time it's Flirty Flamingo, which I've paired with the gorgeous Petal Passion Designer Series Paper. 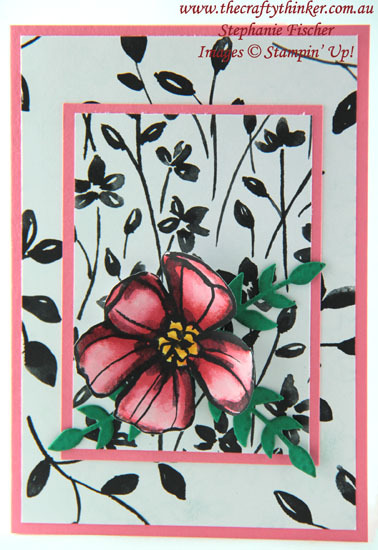 Petal Passion paper makes for a quick, easy and pretty card! 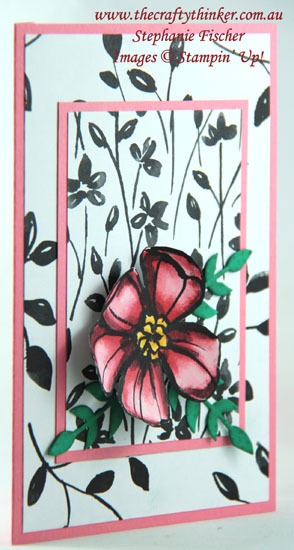 The flower is from one of the sheets of Petal Passion paper - I watercoloured it and then cut it out. The leaves are cut from Emerald Envy cardstock (another of those retiring colours) and then sponged with a touch of Tranquil Tide ink. The flower was lightly curled with a bone folder and attached with a dimensional.